Horse apo ferritin (PDB: 4v1w). Despite its reputation as an innocent essential mineral, excessive iron intake can be poisonous, and maintaining the proper amount within our cells requires a molecular balancing act among several biochemical pathways. Even at levels that are not overtly toxic, iron overload in humans has been associated with an increased risk of obesity and related conditions, such as type II diabetes and high blood pressure. The reason for the correlation has so far eluded researchers, but research published in the May issue of GENETICS provides insight into iron’s role in fat accumulation. To find genes involved in animal cells’ response to excessive iron, the study’s authors subjected Caenorhabditis elegans (nematode worms) to high levels of iron while using mutation and RNAi knockdown to test the effects of about 2000 genes. 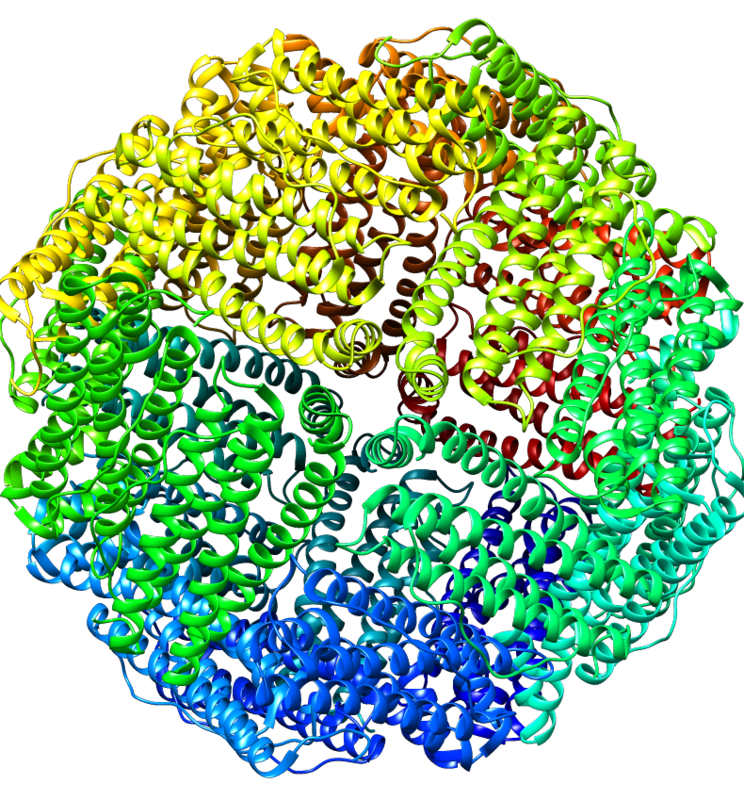 They were searching for genetic variants that affected ftn-1, which encodes a type of ferritin. This protein protects cells against high iron concentrations by binding the mineral, sequestering it away from vulnerable biological molecules. To narrow down this list of ftn-1 modifiers to genes that might shed light on the relationship between iron overload and fat storage, the researchers stained the worms with Nile Red, a dye with an affinity for lipids. Among the mutant strains with abnormal fat storage, the researchers found that losing function of the gene sgk-1 decreased ftn-1 mRNA levels, while a gain-of-function mutation in the same gene increased the amount of ftn-1 mRNA. This suggests sgk-1 positively regulates ftn-1 expression. When exposed to excessive iron, sgk-1 gain-of-function mutants also had larger lipid droplets and more fat accumulation overall compared to loss-of-function mutants or wild-type, implying that sgk-1 might be a key intermediary in the relationship between iron overload and fat accumulation. This wasn’t a complete surprise: The mammalian orthologs of sgk-1 encode proteins involved in iron homeostasis as well as sugar and lipid metabolism. In humans, a positive correlation has been found between a common sgk-1 variant and obesity, type II diabetes, and hypertension. Sgk-1 wasn’t the only gene that affected both ftn-1 expression and fat storage. Using the screen data and follow-up experiments, the researchers identified many components of a pathway connecting sgk-1 to iron and lipid uptake. For example, the gene cyp-23A1 seemed to function as a ferritin repressor, likely by decreasing sgk-1 expression. By screening strains with mutations in known lipid transporters, they found that deletion of acs-20, which is an ortholog of a mammalian fatty acid transporter, abolished the fat accumulation associated with excess iron. This result may explain how iron allows extra fatty acids to enter cells, but one major step was still missing in the new pathway. Once fats get into cells, they need to be ferried to lipid droplets for storage. In search of the missing link, the researchers screened a group of genes homologous to components of mammalian LDL (a.k.a. “bad” cholesterol), called vitellogenins. Deleting one of these genes (vit-2) prevented the lipid droplets from growing after exposure to iron, suggesting that vit-2 was responsible for transporting lipids for storage. And solidifying the notion that vit-2 is part of the new pathway, the researchers found that loss of sgk-1 function nearly abolished vit-2 transcription. The sgk-1 pathway may be relevant in other organisms, since homologous proteins exist in humans and other animals. And promisingly, sgk1 knockout mice seem physiologically normal; understanding this pathway could provide insight into the relationship between excess iron and lipid storage related problems such as diabetes and heart disease in humans, and—one day—lead to treatments. Wang, H., Jiang, X., Wu, J., Zhang, L., Huang, J., Zhang, Y., Zou, X., Liang, B. (2016). Iron Overload Coordinately Promotes Ferritin Expression and Fat Accumulation in Caenorhabditis elegans.